The ILCD Handbook was written by a panel of scientific researchers and experts in LCA, whereas the CEN TC 350 standards were written by a panel of building stakeholders as well as LCA experts. The level of detail varies considerably between the CEN standards (around 50 pages) and the ILCD Handbook (around 1000 pages in total). The main differences between the ILCD and CEN TC 350 standards can be found in their terminology and provisions. For example, EN 15804/EN 15978 proposed new terms such as the ‘functional equivalent’ of a building to adapt the ‘functional unit’ term defined in ISO 14040 and in the ILCD for the building sector. As a result, these documents may often conflict in the definition, the level of detail and finally the provisions to adopt for each LCA step, and for each life cycle stage. A systematic procedure was therefore adopted in the EeBGuide for choosing the basis of the guidance included for each aspect. 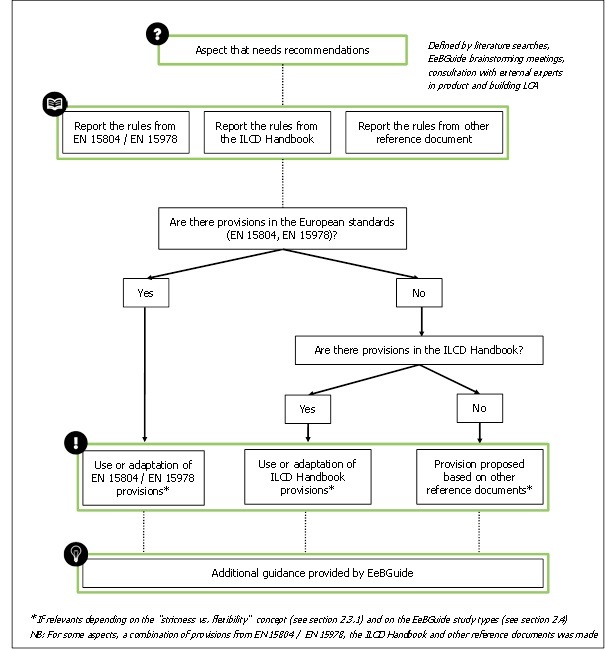 As mentioned above, the EeBGuide tries to combine provisions and guidance from the EN 15804 and EN 15978 standards and the ILCD Handbook (see Figure 5). If cases of contradictory approaches appear in the reference sources, then the EeBGuide always tries to state a provision or guidance transparently for both the standard and the ILCD Handbook. As far as possible, the EeBGuide provisions follow the European standards [EN 15804] and [EN 15978] closely. If the standard does not mention a certain aspect, or if it is not very clear on that aspect, provisions and guidance from the ILCD Handbook are provided. Where no existing guidance is available, other provisions are proposed by the EeBGuide. Guidance can include links to further interesting or important information, or to examples, or present an interpretation of the standard or the ILCD Handbook. This interpretation is not meant to be a provision, but rather a means to share LCA experiences from LCA practitioners and experts. This entry was posted in Construction products, Existing buildings, General, New buildings and tagged Study type: Complete LCA, Study type: Screening LCA, Study type: Simplified LCA by Zsoka Gyetvai. Bookmark the permalink.